Most Cairenes under the age of 30 likely do not know of the city's once thriving and influential Jewish Community. 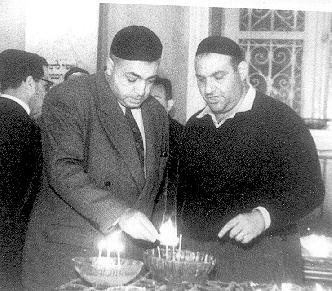 Most are not aware that as many as 55,000 Egyptian Jews lived in greater Cairo and frequented as many as 37 synagogues throughout the city. Some might recognize names like Cicurel, Osrosdi-Back, and other hallowed names from Cairo's past. Nevertheless, Cairo's Jewish Community remains but a shadow of its former self�and a distant memory in the minds of most Egyptians. Which is why on a blustery Friday afternoon in early December, a group of students from the American University in Cairo (AUC) sought to capture a few of these distant memories. 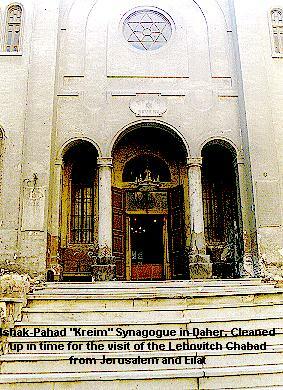 Representing a multitude of faiths and backgrounds, they students rolled up their sleeves (both figuratively and literally) in an attempt to preserve a forgotten piece of Cairo's diverse religious history: the Pahad Ishak Synagogue, otherwise known as the Kraim Synagogue. "There have always been Jews in Cairo, even until today. There has been an unbroken Jewish presence here since the times of Moses," says Aaron Kiviat, a Seattle native doing his senior year abroad at AUC. Kiviat first caught word of the need to restore such synagogues through the local Jewish Community Council (JCC). Upon entering the century-old synagogue, the students found a traditional Sephardic sanctuary, with separate areas for women and men, covered in decades of dust and neglect. Strewn through the synagogue were prayer books, benches, and teffilin (traditional prayer boxes strapped to the left arm and forehead). Throughout the day, benches were moved, floors with seemingly endless piles of dirt swept, and passageways cleared passageways. Along the way, less worldly artifacts were found such as syringes, decomposed cats and several (now rancid) bottles of Kosher wine. Like many Jewish communities in the Middle East, the Egyptian Jewish community has come to be defined by a series of exodii mirroring the political history of the region. After the 1952 Revolution, many Jews left along with Italians, Greeks, and Maltese. They could all do without the nationalist, anti-foreigner rhetoric. Heightened anti-Jewish sentiment in the wake of the Suez Crisis and the 1967 Arab defeat forced many more to leave. Statistics vary as to the remaining Jewish population of Egypt. "Maybe 100, we don't know," says JCC Director Carmen Weinstein. 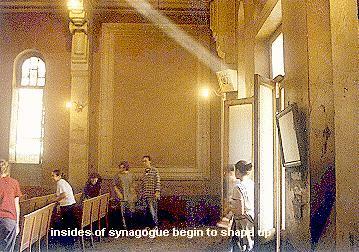 The long-term goal for projects such as this is to establish a "synagogue walk" of refurbished synagogues in Cairo. "We want people from all faiths to visit these Houses of God and see how our community once lived," says Weinstein. However, she remains keen to the fact that such endeavors cannot rely solely on the volunteered time of a handful of students. "We need sponsors for restoration and maintenance in order for this to succeed" she noted. 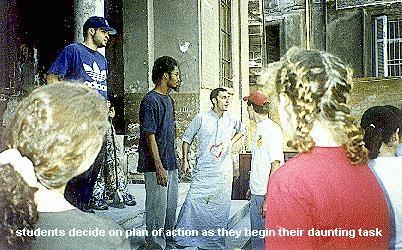 "Ben Ezra Synagogue (in Coptic Cairo) was refurbished because of a contribution from a Canadian group." Still, Weinstein's vision remains pure, "I want people to see that there was once a time when Arabs and Jews lived together, side-by-side, and there were relatively few problems." Over the last several months I spent my Wednesday afternoons at the Italian Hospital in the Cairo suburb of Abbassia. 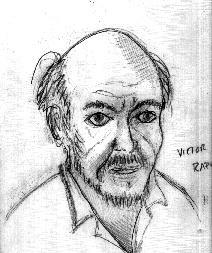 Across the courtyard of the hospital in a room painted a light shade of blue sits an old Jewish man by the name of Victor Raffaelle Levi. Victor spent his entire life in Egypt. He was born in Kobbeh, Cairo, some eighty years ago and has never ventured abroad. His grandparents were originally of Italian orgin. They were named Sabatino and according to Victor, his grandfather was a wealthy buisnessman. His parents passed away when he was in his teens and he took over his familly's Kiosk where he sold mostly magazines and cigarettes. Victor has no immediate family to speak of and when the wars with Israel began, and the Jews left, he felt he had no reasons to flee. Last year he contacted the JCC following an illness. The JCC decided it would be best if he went to live in the Italian Hospital where he could be properly cared for and looked after. Although I have gone to see him several times, often bearing gifts and sometimes accompanied by other young visitors, it seems he is reluctant to tell his life story. His first language is Arabic and he claims to speak Italian as well, two languages which I have very little grasp of. Most of the time he just sits and listens to me ask him questions in broken Arabic, answering me with Yes or No responses. I know however, that Victor is happy to see me because he always asks when I will return. He feels safer now knowing the JCC is looking out for him. One of the few remaining Jewish men in Egypt, Victor symbolizes a time when being Jewish and Egyptian wasn't such an oxymoron. Unfortunately, he was unable to attend this years Hannuka celebrations due to his health. I look forward to telling him about the sucessful party the next time I visit. Daniel Lanson who taught at Maadi's Lycee Francais during the mid-1990s just published a book on Egyptian-born poet Edmond Jabes. "Jabes l'Egyptien", editions JeanMichelPlace, reads like a contemporary history book on Egyptian Jewry and is choc full of insights on Fance's cultural influence in Egypt during the first half of this century. Jabes l'Egyptien (over 350 pages) includes maps, chronological sequence of events, an interesting bibliorgraphy, a list of French-language cultural events in Egypt, and pictures. Anyone wishing to read a summary of the history of modern Jews in the Arabic press should refer to a two-page article in El Shabab's (THE YOUTH) issue No. 257 of December 1998. 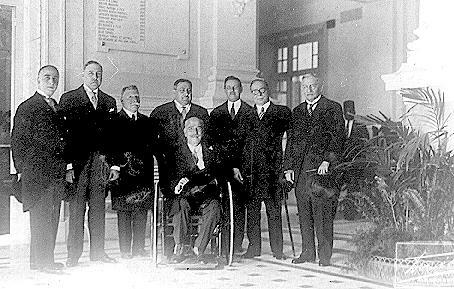 In her extensive research, editor Nadia Mansour recounts the highs and lows of the community from the days of Prophet Moses, a sometime prince of Egypt to Youssef Cattaui Pasha, a sometime cabinet minister and senator during King Fouad's reign (1917-36). Mention too is made of Maimonides --philosopher and sage-- and Egypt's adored screen goddess Laila Mourad. From her interviews with the sitting presidents of the Alexandria and Cairo Jewish commmunities, Mansour gives her candid insight on a 100,000 strong community which dwindled to three digits in less than a century. This issue's incomplete family tree is about the JABES of Cairo. See if you can add to it. 1.Renato Del Mar was into pharmaceuticals... remember the Del Mar pharmacies? 2. Daoud Ades owned Ades department Stores. 3. Jacques Calderon owned Cairo's leading music shop. See if you can match each of the following Egyptian-born damsels with her correct spouse. Well, I have been embarrassed into writing a bit more about my experiences in Cairo. Each time I do so it is a mixture of bittersweet memories. None were used for prayer by the early 80's and there were only a few Jews still living in the neighborhood. 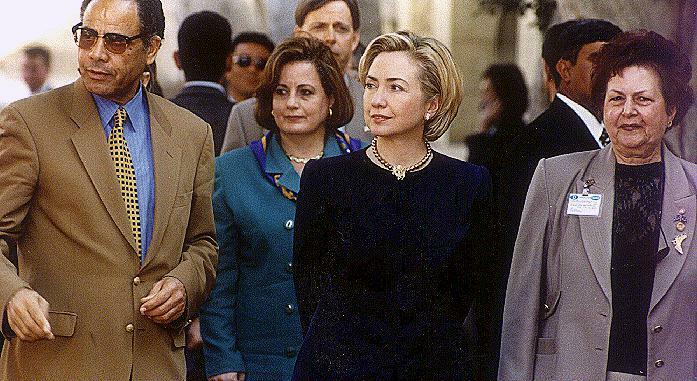 I remember Marie Tamim, Berta and Yousuf Sourour, David and Claire Molho and Rachele Grego. There may have been a few others whose names escape me now. The "shammashah" of the Pahad Ishak synagogue was Jeanne Hakim nee Mani. She was born in Baghdad and still spoke with a strong Iraqi accent. She was one of the few women in Cairo who could read Hebrew and knew the service quite well. She was quite a pack rat and never threw away anything, so I was not surprised to read that the wine bottles and things were still there. There used to be many plastic oil bottles as well� There was a guardian living in the courtyard. I think her name was Sayyidah. Neve Shalom was almost empty when I was in Cairo. The Heikhal (Ark) in this synagogue was exceptionally beautiful with the prevalent date palm motif. The Nessim Ashkenazi synagogue was the oldest of the synagogues in the area, built in the 1890's. It was in very poor condition with a big crack running through the building. It had a beautiful ark and a blue cupola painted with stars. There were old posters with pictures of former Grand Rabbin Hayyim Nahoum there. In addition to the synagogues there were traces of the former large Jewish presence in the area such as a sign from the old CARMEL movie theater, faded signs of Midan Torsina (Mount Sinai Square) and the barely visible words in Hebrew "Basar Kasher" (Kosher meat) on the window of the only store selling Kosher meat on Rue Qobessi in Ghamra. Meat was sold by two Muslim brothers, Adri and Fayez, but meat was slaughtered by the only Shohet in Cairo, Jacques Hamaoui. While writing this I have remembered of several expressions in French/Arabic and Hebrew that I think were peculiar to Egyptian Jews. One of the things I remember hearing a woman saying in Haret al-Yahoud� "Le chemain etait marchoucha et je me suis etzahla'e"'. liberal trans: someone had sprayed water on the street ( a common practice to keep dust from getting into everything) and I slipped. Or "Faites vous voir" translated from Khalleena nshoofak. Trans: Hope to see you soon.  Hallakh (with double L�lit. "went") passed away. I would be curious to hear about other similar linguistic terms from Bassatine News readers. If there is interest, I can write about other areas of Cairo and other areas of Egypt in the future. Mr. David Hirsch is Middle East Bibliographer at the Charles Young Research Library, UCLA. One of the 1998 highlights for the Egyptian Jewish Diaspora was the unforgettable "La Gloire d'Alexandrie" expo which took place from May 5 to July 26 at Le Petit Palais on Avenue Winston Churchill, Paris. Widely attended by Alexandrophiles from all over the world, visitors were treated to several centuries of treasures from the ancient megalopolis. The exhibits came from various international public and private museums. Although "La Gloire d'Alexandrie" was officially inaugurated by Presidents Chirac and Mubarak in June, it was accessible to the public since early May following a soft opening attended by the Mayor of Paris and the Egyptian Ambassador to France. Aside from the strong Franco-Egyptian cultural relations, "La Gloire d'Alexandrie" was made possible thanks to several multinational blue chip sponsors foremost of which was Gilbert de Botton's GAM (Global Asset Management). A native of Cairo and Alexandria and a graduate of Victoria College, Gilbert --only child of Isodore de Botton and Yollande Gabbay-- left Egypt in the early 50s. Upon completing his university studies he joined the finance world working in turn for Banque (Abdallah) Zilcha and Rothschilds Cie. Today, Gilbert de Botton runs one of the biggest private investment funds in Europe. He is the father of best-selling author Alain de Botton ("Comment Proust Peut Changer Votre Vie") and Miele (Mrs. Angus Aynslie). Following a private viewing of the exhibition on May 6th, Gilbert de Botton and his British wife the Right Honorable Janet Wolfson (daughter and granddaughter of Lord Leonard and Sir Isaac) hosted a dinner for some 100 guests at the legendary Ledoyen restaurant off the Champs Elysees. The guestlist included Egypt's top drawer Jewry: Mosseris, Smouhas, Sinigaglias, Mehrez, Nadlers, Sharons, Castros, Danons (Grand Rabbi Haim Nahum Effendi who replaced Raphael Bensimon was married to Sultana Danon), de Picciottos, Najars, Doueks, Mizrahis, Riches, Naccamulis and Zilchas. Present as well were Baron Elie de Rothschild and French Archeologist Jean-Yves Empereur of Pharos Lighthouse fame. The latter gave a brilliant expose on his works in Alexandria and his recent re-discovery of the pre-Roman catacombs in the age-old district of Gabbari. The dinner was also attended by Aziz Tousson, youngest son of Prince Omar Toussoun a.k.a. 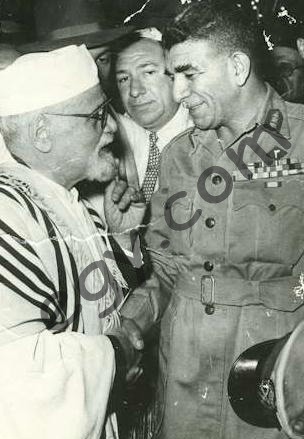 le prince d'Alexandrie, as well as Egyptian writers Azza Heikal ("Educations Alexandrine") and Samir Raafat (Maadi 1904-62; Society & History in a Cairo Suburb). Athlete, boxer and scout master Adolf Feldstein dies in Cairo from an accidental fall at age 35 in December 1941. He represented Egypt in several international boxing bouts. Banque Rothschild's (France) new boss, Michel Cicurel, is the grandson of Solomon Cicurel of Cairo and a great grandson of Moreno Cicurel founder of the Cicurel and Oreco stores of Egypt. 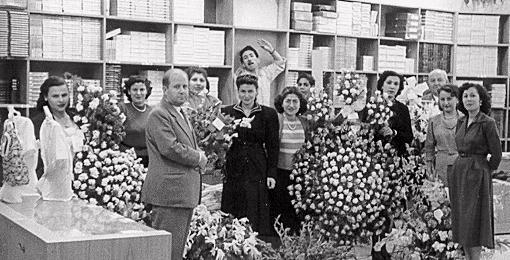 Marco Benyacar and his sales team celebrating the re-inauguration of "Jacques" (or "Jacques des bas" as it was nicknamed) on Cairo's Midan Mustafa Kamel ex-Suares following the burning of Cairo on 26 January 1952.